We’d love your help. Let us know what’s wrong with this preview of The Psychoanalysis of Fire by Gaston Bachelard. To ask other readers questions about The Psychoanalysis of Fire, please sign up. With this book, Bachelard cements his reputation as an intellectual charlatan. Recklessly speculative, shockingly devoid of empirical evidence, and brazenly inaccurate. In other words, highly recommended. Bachelard is very difficult to talk about or review. It's not that his writing is difficult, but rather that his subjects are so elusive, and he never shies away from avoiding specific conclusions; in fact, to specify conclusions would be contrary to his intent. Trying to specify a conclusion in his writing would be like trying to describe the shape of a flame (an easy simile but it's apt). His writing is like a flame (but somehow a soft flame that would never burn too terribly) in that there is Bachelard is very difficult to talk about or review. It's not that his writing is difficult, but rather that his subjects are so elusive, and he never shies away from avoiding specific conclusions; in fact, to specify conclusions would be contrary to his intent. Trying to specify a conclusion in his writing would be like trying to describe the shape of a flame (an easy simile but it's apt). His writing is like a flame (but somehow a soft flame that would never burn too terribly) in that there is a general shape but no specific shape, it's there and not there, an immaterial materiality. Yet behind all this gauzy unspecificity is an active needle-sharp mind, probing and probing, obsessed with origins and the root of all things. The title of this particular book is somewhat deceiving. It's not that he politely asked a flame to lay on the couch and proceeded to question it about its tyranical mother. Rather the psychoanalytical subject is the human conceptualizations of fire, our subjective (masquerading as objective) responses to it. And through this study he lays bare the fallacy of scientific objectivity, the impossibiltiy of it, because we are simply too ruled by our passions and our loves. When we look at something such as a flame or a fire, no matter how determined we are to remain detached and objective, a revery is induced that causes our emotional body to project itself onto the flame, which in turn alters our conclusions. Bachelard makes the intriguing argument that one might analyze poetry in terms of which pre-scientific element—earth, air, fire or water—dominates in its imagery. His thesis is that our cosmologies contain subjective elements, reflected in metaphors, and that these subjective elements can be psychoanalyzed. In this respect, literary analysis is a psychoanalytic technique, and the metaphor is a kind of symptom (one finds similar suggestions in the work of French psychoanalyst Jacques Lacan). Before I read this, I thought it wasn't possible to psychoanalyze fire. I mean, you're not exactly going to get it to free associate. Boy was I wrong. النار بفكر وشكل آخر ، كفلسفة وإسطورة وعلم نفس ، كخُرفات وحلم يقضة و محسوسات ، أعتقد أن الترجمة التي لدي من قبل زينب الخضيري لم تكن موفقة كثيراً أو أن الكتاب غير مترابط بشكل دقيق في طرحه وأفكاره ، وكما قال الكاتب نفسه" هذا الكتاب لن يُضيف للقارئ شيئاً يُذكر كمعرفة ! " I discovered this fascinating little book more or less by accident. His philosophy of science is natu I discovered this fascinating little book more or less by accident. His philosophy of science is naturally very different from anything else I've read; while the A-A-A philosophers at the time were essentially concerned with normative issues of logic and epistemology, with how we "ought" to do science -- later with Kuhn and company it turned toward sociological and socio-political description -- Bachelard was concerned with psychological apects of scientific investigation, what he describes as "the psychoanalysis of objective knowledge." His point is that the scientists' theorizing is influenced by pre-scientific "complexes" derived from the experience of "reverie", which must be subjected to a form of "psychoanalysis" to be able to free oneself from these complexes and observe phenomena objectively. 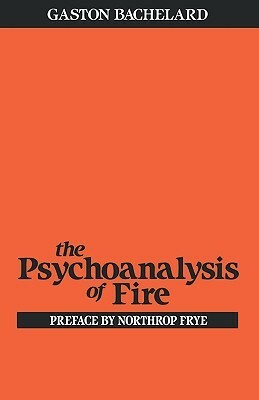 In this book he focuses on the various ideas relating to fire, and identifies pre-scientific groups of ideas which he calls the "Prometheus complex", "Empedocles complex", "Novalis complex", and "Hoffman complex", and traces them in early modern physical and chemical theories of the nature of fire. Bachelard changed my outlook on everything related to art. Highly recommended. I was fascinated by the title and intrigued by the subject matter of this book, but after reading it I can't really recommend it for anything other than a snapshot of its time. To be fair on Bachelard he does say in the introduction that after reading this book, you will not have gained any knowledge whatsoever. In this he is absolutely correct. Bachelard's thesis is that humans' relationship with fire is so ancient and vital that it is almost impossible for us to look at fire objectively. He cla I was fascinated by the title and intrigued by the subject matter of this book, but after reading it I can't really recommend it for anything other than a snapshot of its time. To be fair on Bachelard he does say in the introduction that after reading this book, you will not have gained any knowledge whatsoever. In this he is absolutely correct. Difficult at times, then is as clear as fire itself. Surprising, infuriating, unforgettable. Um livro teórico simplesmente encantador. Inaugura a obra noturna do Bachelard brilhantemente. Na introdução, Bachelard alerta que leitor não aprenderá algo com a obra... modéstia pura. Aprendemos e muito com a leitura. not freud sitting down with heraclitus, sadly. just what is in the id of the polemos, anyways? this is my favorite book in a long while. a "psychoanalysis of objective knowledge" which reveals the hilarity of so-called objectivity when it comes to something as common as fire. read it. This is one of Gaston Bachelard's best (see my review of The Poetics of Space). Anything by Bachelard is profound and enriching. Nice transition between the philosphy of science and aesthetics. Think alchemy.